Mary Shelley reached into the dark depths of her imagination to form the character Frankenstein, a scientist who, let’s face it, was getting a bit ahead of himself when he decided to create a man from a selection of body parts. Horrifying stuff. It would never happen in real life, would it? On a dark early January morning I found myself alone and isolated. All I could hear was the crunch of the frosted grass beneath my feet as I made my way through the low lying mist. 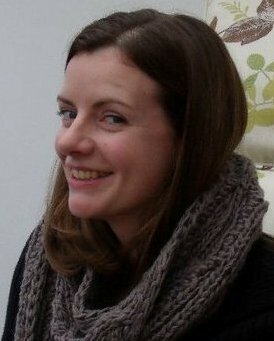 I pulled the collar of my coat up around my neck as I felt a chill gathering around me. I heard a twig crack behind me and snapped my head round, but could see nothing. I could see no one. I found a large rickety gate. Could this be it? Despite the cold, my hands were clammy. I scrambled trying to unlock the gate. I dropped my gloves to the ground, but still the catch wouldn’t release. My fingers were numb from the freezing cold and wouldn’t follow the instructions from my racing mind. I could feel sweat prickling my skin. I heard something behind me… distant footsteps quickening in pace, getting closer. I jammed my boot under the gate and flexed my foot, pushing the steel toecap hard up against the metal bar in an effort to lift it a few millimetres. The gate catch released, emitting a loud creak as I pushed it open. Snatching up my gloves, I lurched forward slamming the gate behind me. I reached into my pocket for my sharpened knife and braced myself. I was ready. Yes, I had been finishing some work in the classroom and was racing down to the nursery stock ground to meet up with my classmates to collect scions. Turns out I wasn’t the last to join my group and I apologised for closing the gate on my friend. I was just making sure no sneaky rabbits could make their way in. It turns out I only needed secateurs for this exercise. We were collecting scions. A sharp knife was for the next phase. For years I have been eating apples in blind ignorance of how they are propagated. 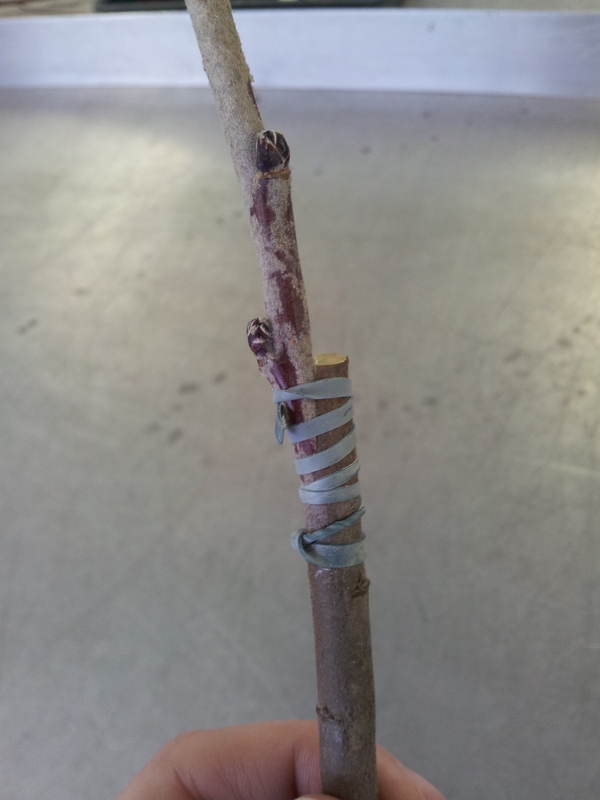 It was only a few years ago when I came across a BBC documentary ‘Apples: British to the Core’ and Alys Fowler’s show ‘The Edible Garden’ that I discovered grafting was necessary to propagate a specific fruit variety e.g. the Bramley apple. 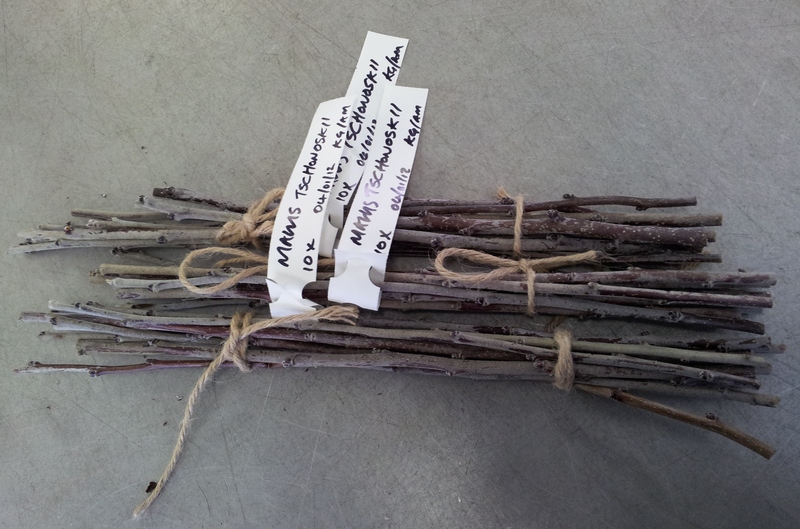 Rudimentarily, it involves sticking a twig of one type of fruit tree to a compatible root stock. 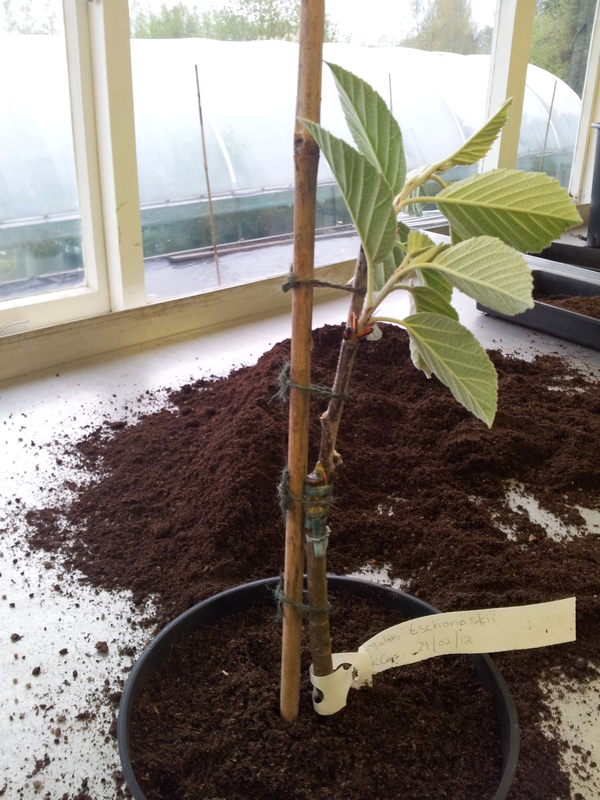 The rootstock determines the size and vigour of the plant. The possibilities are endless. In the October 2009 issue of RHS ‘The Garden’ magazine, there is a picture of Paul Barnett’s apple tree on to which he has grafted 250 cultivars of apple. It's not just a stick. It's a special stick. bevelled side perfect for the job in hand. 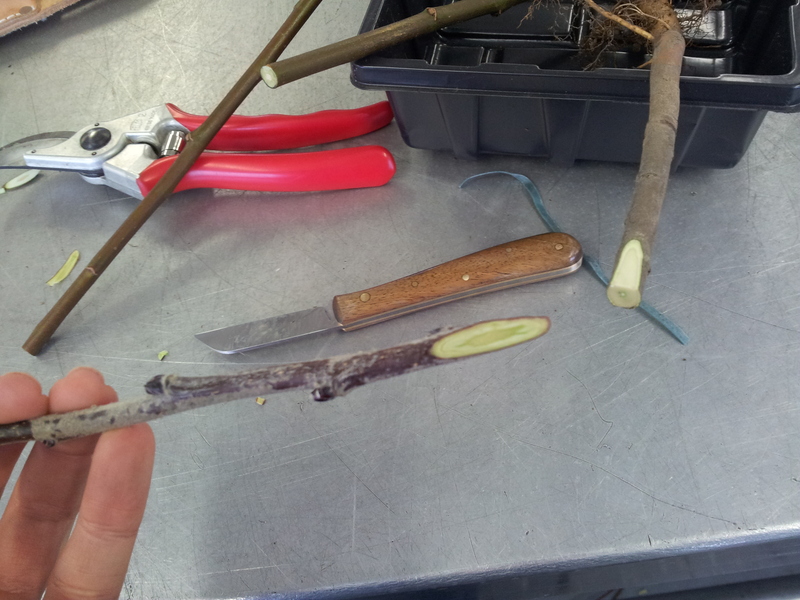 After practising my cuts on bits of twig, I made my incisions into the scion taken from a Malus tschonoskii and into the rootstock, slicing away to reveal the cambium layer. Carefully, I matched up the exposed wounds of the scion and rootstock so the cambiums were sitting flush against one another and bound them together to create a union. After painting over with wax, I placed it in the glasshouse by resting the union on a warm pipe. 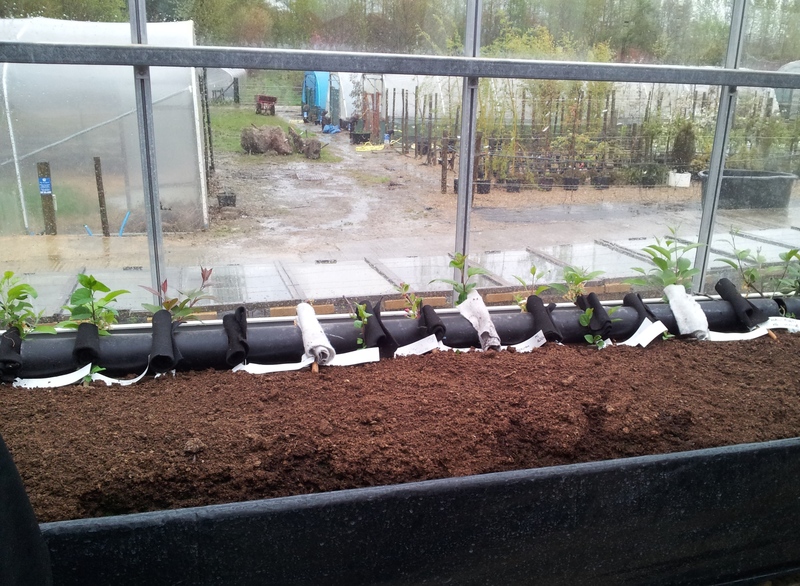 I then tucked it in with a roll of material and covered the roots with compost. Then waited and hoped. Last week, in the driving rain I made my way over to the glasshouse. Flashes of lightning reached across the dark grey sky. 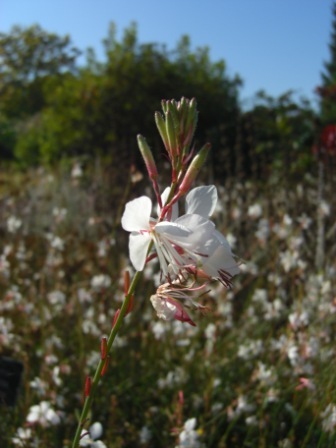 A deep rumble of thunder rolled through the nursery as I held the grafted scion aloft – IT WAS ALIVE! The static and moisture in the air as well as the high winds helped to really frizz up my hair, adding to the deranged scientist look. You’ll have to take my word for it because I won’t be posting that photograph here. Far from creating a monster, I had successfully fused one type of tree with another using a method that has been around for centuries. With my new found knowledge I intend to find an apple tree with a minimum of two cultivars for my own small garden space, which I can grow in a container. I’ll be looking for a spur-bearing apple, as opposed to a tip bearing one, on a M26 rootstock to keep it small. All I need to do now is work out which cultivars I find most tasty. I think an October visit to Brogdale Farm’s apple festival might be in order.